– ANY COLORS/COLOR COMBOS FORM THE US FLAG (RED/WHITE AND/OR BLUE). Organized gang stalkers sensitize their victims to certain colors/ patterns/ styles to make them believe they are followed everywhere they go and “everyone” is in on it. I was sensitized to color harassment on 6/19/12, 3 days after I discovered organized gang stalking on a google search and realized I had already been stalked for years. There is a 1.5 mile walking trail near my house. It is a loop that surrounds an expensive housing development and passes a golf course. I have been walking on it for about 3 years. I was first sensitized to neon colors. A woman passed me jogging in neon pink shorts, another passed me wearing neon green shoes, another passed me in a hot pink sweater, then neon blue shoes, and so on, including dogs with neon collars and leashes. I would pass someone wearing neon every few minutes. It was not coincidental and I had never experienced this on the trail before. It persisted for my entire walk. -As the days and weeks passed, I would see these colors everywhere. They eventually added bright turquoise, purple, bright green, bright blue, bright orange, bright yellow, brown, and any combination of red/white/blue. (All of the colors from the gay rights rainbow flag and the American flag, pluse “any “neon” color). -They also frequently wear checked/plaid/madras shirts or shorts, Hawaiian shirts, any stripes, animal prints, polka dots, American flag patterns*, jeans rolled up to the knees with high heeled black sandals, maxi dresses, mens’ bathing trunks with wide color darts on the sides (not sure what brand this is). – Aviator sunglasses, secretary-style reading glasses, sunglasses with white or neon colored frames, cheap Foster Grants. A lot of scarves worn in “perp” colors. Sequins, esp. on girls. Clothing w/ Eiffel tower, owls, “Paris”, American flag graphics on them. – Under Armor brand clothing, Polo/Ralph Lauren clothing, camoflauge prints, straw “boater” hats w/ short rims, and anything with San Diego Chargers (Bolts) logo. – Also A LOT of tattoos (sleeve and calf tats very common) and neck lanyards. – Crocheted tops, lace tops, tie dyes, Croc shoes. Moccasin style loafers or dark brown New Balance hiking shoes for men. Flip flops and high heels frequently worn for noise harassment. Dansko clogs for women. Jeans with one leg rolled up. – Bright orange or yellow safety vests everywhere. Any one who has an excuse to wear one will don one, some will just wear it as part of their “costume”. If this sounds like things you would usually see ordinary people wear, including myself, you are right. This is where the mind f*ck comes in. The difference is they will flood the area you are in with these colors/brans/styles of dress to the point where it is conspicuous. So when I am taking a stroll down the 101 highway and clusters of people wearing neon, red, turquoise, purple, and yellow clothing pass me continuously over a span of 40 minutes, I know they are perps. Their aim is to to do anything possible to distract and harass you (without touching you), with frequency and duration, everywhere you go. The colors are worn by infants, children, teens, men, women, elderly. The colors are worn by receptionists, therapists, doctors, local public officials, road crews, restaurant workers, churchgoers, union reps, coworkers, school teachers, and so on. This morning I took a walk while I waited for an oil change on my car. I saw this jogger (see pic) coming up behind me on the sidewalk. I got off the sidewalk to avoid him as he is wearing a “perp” color. 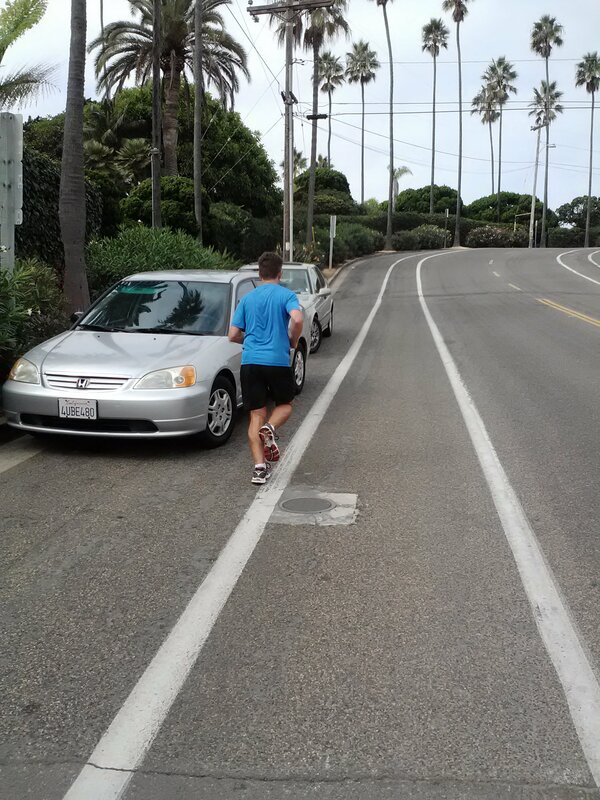 He got off the sidewalk right after he passed me so he could run right in front of me. Not only do they want you to see them, they want to RUB YOUR FACE IN IT. I’ve seen some of them repeat the same gestures over and over and over again OBSESSIVELY to ensure that I took notice. Many of them do not have a shred of self control. *The perps have placed the American flag everywhere in the forms of flags and stickers of all sizes on houses, cars, trucks, buses, storefronts, restaurants, office buildings, medical buildings, in churches and schools, on business cards and clothing. This entry was posted in Uncategorized and tagged color coordinated harassment, Color harassment, Covert group stalking, Gang stalking clothes, Gang Stalking colors, Gang Stalking Fluorescent colors, Gang Stalking neon colors, Gang stalking patterns, Gang Stalking Purple, Gang Stalking turquoise, NLP color sensitization, Organized Stalking, sensitization gang stalking, sensitization to colors. Bookmark the permalink. Cant say ive ever noticed this…i wouldnt believe at all but saw a perp in a red car one day….so im a believer it goes on. I get the color stalking too, my perps wear red. They went from red to green because people are talking online about their red shirts and cars. Now the cars are mostly black and white. It is hard to spot them now, but I no longer care. I just don’t get friendly with people anymore and don’t listen to their garbagey street theater. They are the losers. We should try to be as happy as possible in our homes and personal time, so ignore them big time and don’t fall for their tricks. I have been known to wear ALL of these colors of clothing, because I think every person in life, should try to wear ALL colors of clothing, in life, even the tacky prints! I have been known to wear tacky prints too! I have even worn clothing that makes me look like I’m naked too! I know, that’s really gross, to wear clothing, that makes you look like you’re naked, but I wore them anyways! I have got caught in rain storms or whatever, wearing a white t shirt! uh oh, not caught in a rain storm, wearing a white t shirt! I had like a bra on or whatever. even though I had a bra on, I went into this store, MANY years ago, and this guy asked me: Can I Help You, Please? (sounded more like: can I help myself to you, please?) Would You Like A Candy Bar, Lady? (sounded more like: would you like my candy bar in my pants, lady?) ha, ha, ha, HA! was he a PERP? or what? You All Think He Was A PERP? at that store? I’m Like: Uh, No Thank You, And Then I Bought Some Junk Food, And Coke Cola, Or Something Like That……. (I bought a Coke Cola, and Junk Food, Because I Didn’t Want His free stuff!) (his free stuff being what was in his pants, if he could of??) maybe I should of just got the hell out of That store? because he was freaking creepy! yeah, he was a really creepy guy, in that store, and really, I should of just got the hell out of there, or Never have gone in! No, I should of Never have gone into his store at all! I was like in my twenties or whatever, then, and well, YOU ALL Know How guys, Especially More older guys are, with chicks in their twenties?? I felt like he was looking at my A$$ or something! he probably was looking at my A$$, and everything else! ooh gross, he was looking at everything else on me too, probably! by the way: my parents and other people around me, tell me I’m so pretty, even though I don’t think I’m pretty, and that creepy guy in that tiny quick mart like store, Was licking his mouth, like some animal going after meat or something, MANY years ago, in Kansas, when I lived in Kansas, or whatever……yeah, he was literally licking his mouth, like some animal, after meat or something, in his tiny quick mart store! like something out of a horror movie! it was totally like something out of a creepy horror movie! Uhhhh?…. this is a really creepy response. It’s one the colors in the gay pride flag (The PC agenda), the perps like to wear all of those rainbow colors. Green is also the color for Islam. My perps use red and black but I always walk right up and say if you need attention fix your face if it is a woman and if it is a man I say do you think u are powerful enough for red. These people are ridiculous so I turn the tables and embarrass them. FYI it was all black so I am actually intimidating them. LOL somedays I wear red and black and they all look confused. MORONS! It’s a form of government sanctioned witchcraft! I know that’s sounds wild but the whole subject sounds wild to most. I have been a victim of it & had to go searching. It’s a hybrid of govt surveilance if which all agencies & corporations ( including insurance companies) & occult ( hidden witchcraft) combined with modern tech such as cell phones, instant messaging, satellite location & it’s all pervasive. I HAD to find a awy to combat it & was failing miserably till I explored the possibility that it was demonic in nature using tech & human beings. Only then did I explore the bible & found a way to combat it with “ binding & loosing” in the New Testament. There’s actually quite a bit about gangstalking in the bible it’s just not called that. Jesus was gangstalked by religious leaders of his day & so was David in the OT. There’s quite a bit in psalms about it to use on the offensive in spiritual warfare. Try praying out Psalm 59 & see what happens. When I discovered this & went on the offensive they got a real shock & backed off. I put THEM on the run. It took a while for me to discover this so please explore. I’ve given you a tip but you need to discover this yourself. Do the research. No matter how crazy this sounds just remember that anyone who tries to tell anyone they are experiencing this also sounds crazy. What have you got to lose? Understand that these creatures are cowards. They operate from fear. They think you’re a threat for some reason that’s why they’re attacking like this. But they’re stupid. If they had left me alone I would never have researched this & never have been able to pass this knowledge along. Put it into action & watch these pieces of cowardly sh*t back off! Oh they’ll still try from time to time but you go into spiritual warfare immediately & they run. You have to go to God coz they have gone to the Devil. God wins every time & they can & will go to hell. Run into the strong tower of the name of Jesus. It’s safe there.